and out of place in our society. After all, everybody lies - don't they? This page contains a Bible devotion on truth. When I was young, my peers told me that crossing your fingers behind your back made any lie you told void of consequences. Lying was rationalized, excused, and tolerated. Yet, when I watched television, I saw a world where telling the truth was honored and being a man of your word was respected. Therefore, I was presented with both sides of the moral argument. I rarely see both sides of the moral argument presented. the Belt of Truth anymore? Is telling the truth just a choice? Lying doesn't really have consequences.... does it? I do not watch a lot of television. * White lies aren't real lies. * It is cool to lie. * There are few, if any, consequences to lying. * Watching people lie is funny. and then appearing happy about their choice. I encourage you to begin to combat this barrage of media deception being presented in a positive way to your child. One way to do this is to reward your child after he finds a certain number of deceptions - deceptions that are presenting lying in a positive way by the media. This will at least train your child to notice deceptions and regard them as bad models of behavior. Another way to teach your child about honesty and truth is to play an entertaining song about truth. lying is not insignificant but actually a sin. 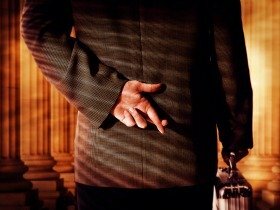 A few years ago, a friend of mine was struggling with lying. I really started to think in depth about the issue of lying. I realized that I had never heard one sermon on lying. Yet as I searched the scriptures, I found that God is very stern toward lying. It began to dawn on me that our society is full of lying. in the media and in daily life. is a form of deception. God calls us to tell the truth. In fact, Jesus said one of his names is Truth. Now that God has dramatically begun to show me the vast problems with deception in our society, I have begun to teach on the subject of telling the truth. During my presentations, I usually assign a person to be Jesus. Then I demonstrate that each time we tell a lie, we actually turn our back on truth - and that means we turn our back on Jesus. When we put that visual picture in our mind, it will help to keep us alert so that we do not take advantage of any subtle invitations to lie. Take note that many times we lie about ourself. "Nobody really cares about me." "I'll never amount to anything." All of those are lies. When we say or think those things, we are lying. God loves you with an enormous, extravagant love. God never meant for us to make lying insignificant. who is the Head of his body, the church." And he who tells lies will not escape." Do my actions show that I promote honesty? if everyone wore the Belt of Truth? "Do not lie to one another." "The righteous hate what is false." Am I teaching my child to tell the truth? Am I modeling - telling the truth or making excuses for lying?